When I was a boy in the 1960s, I was very fortunate that my family spent a year living in London. 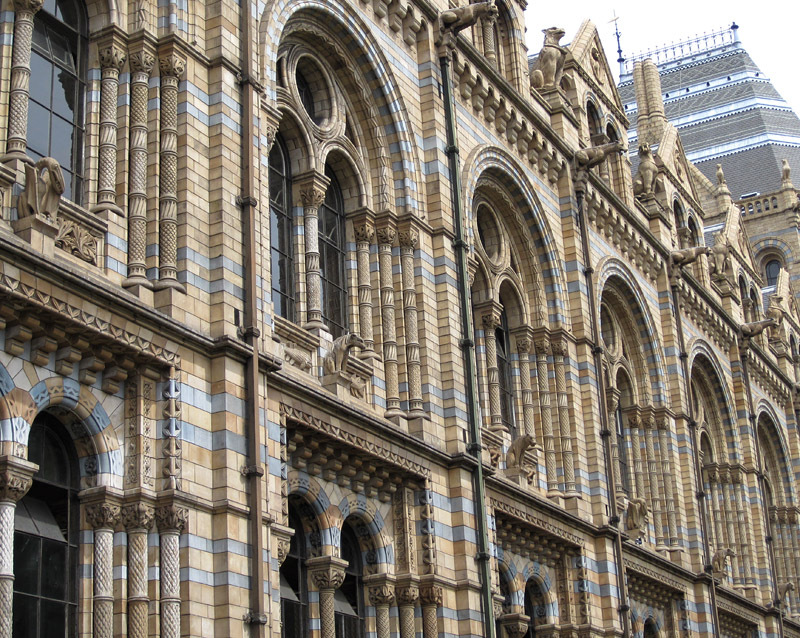 We visited the museums in South Kensington many times; I particularly loved the Science Museum and the Natural History Museum. In hindsight, it seems strange that I never noticed the spectacular details on the exterior of the latter institution, but I attribute this oversight to two factors. First of all, like most London buildings at that time it was still cloaked with a layer of coal grime, received courtesy of the age of steam (a huge amount of coal was burned in London until the practice was banned after the killing “pea souper” fogs of the 1950s). 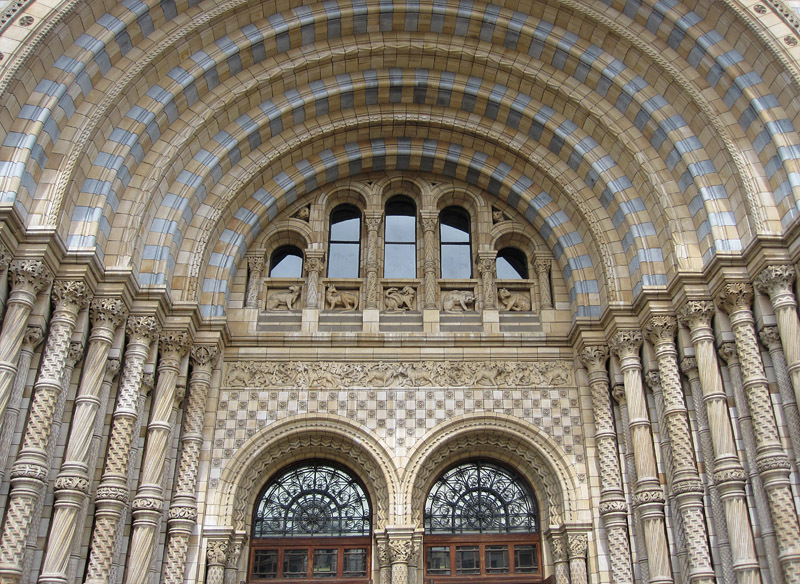 Second, and perhaps most importantly, my seven-year-old self was desperate to get inside to see the dinosaurs and ichthyosaurs, and would not take the time to look at anything else. 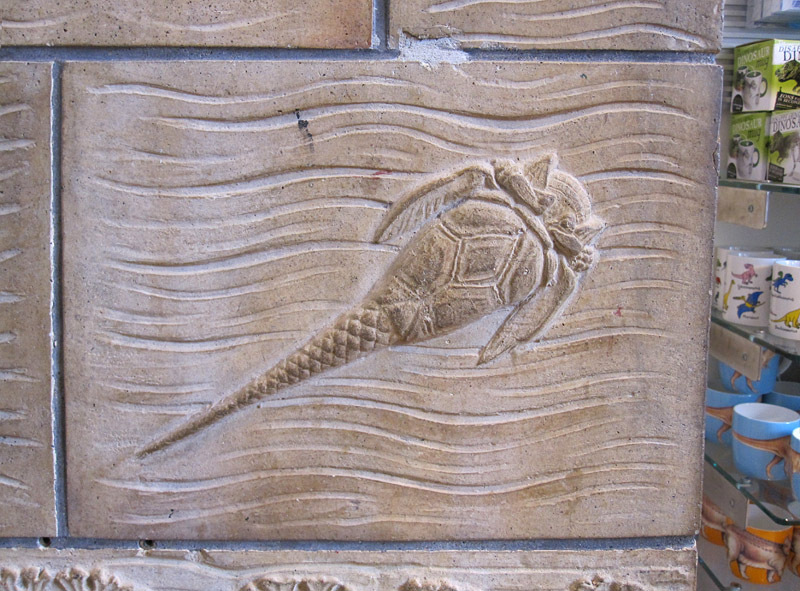 During a visit in the summer of 2010, my fiftysomething-year-old self was able to consider the building’s architecture at leisure, between attending sessions of the International Palaeontological Congress. 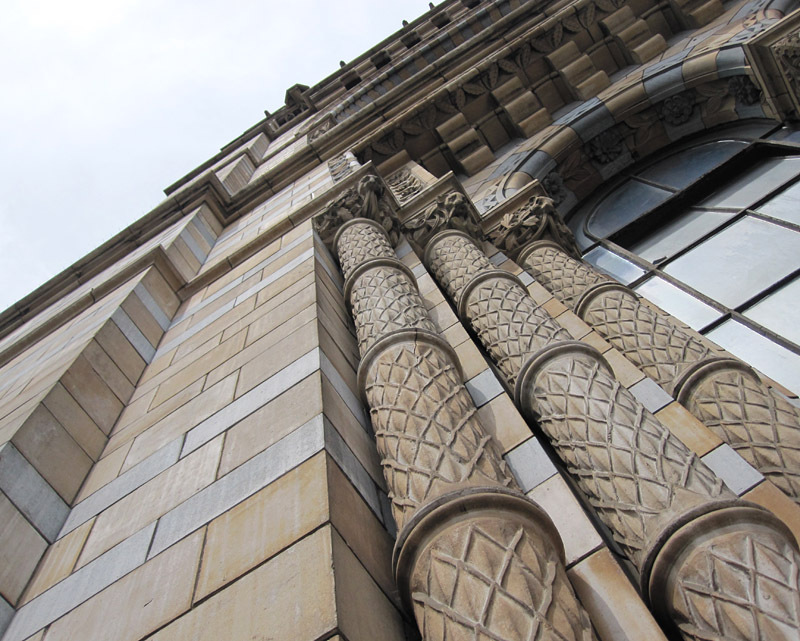 The museum, designed by Alfred Waterhouse, was opened in 1881; its exterior and interior are clad in terracotta tiles produced in Staffordshire, and among the tiles are a tremendous number and variety of relief sculptures of creatures and plants. 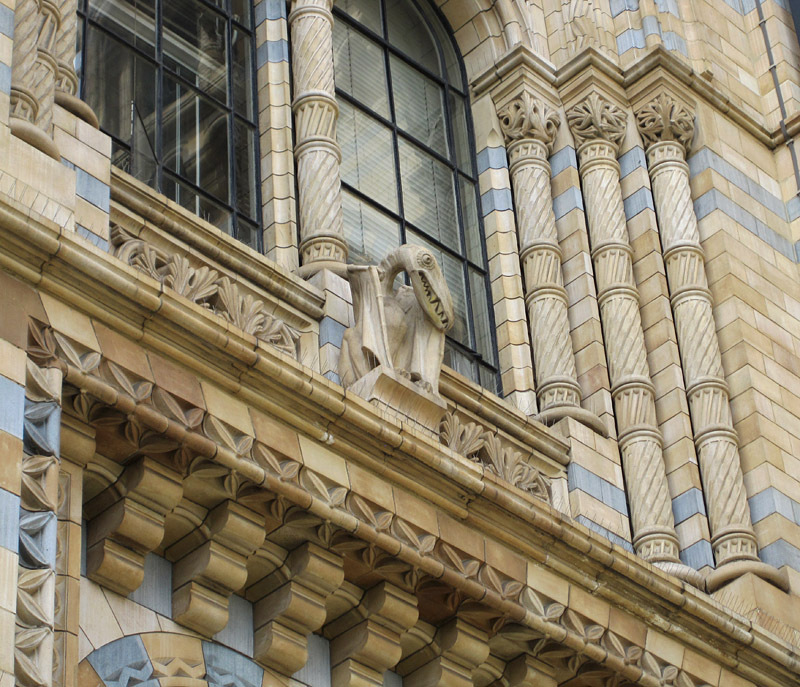 These decorations would make the building worth visiting even if it contained no dinosaurs. Which, fortunately, is not the case. 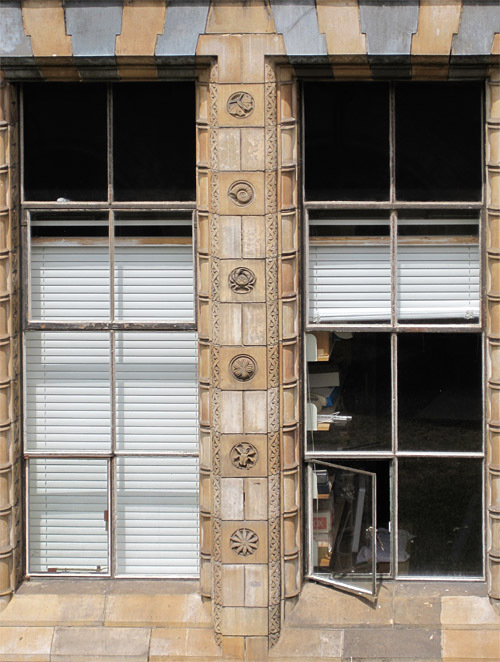 It seems that every window features a different creature and a different variation on the columns. These columns appear to represent a stylized Carboniferous Lepidodendron (or maybe a related genus?). A diverse biota of invertebrates inhabits the space between windows. 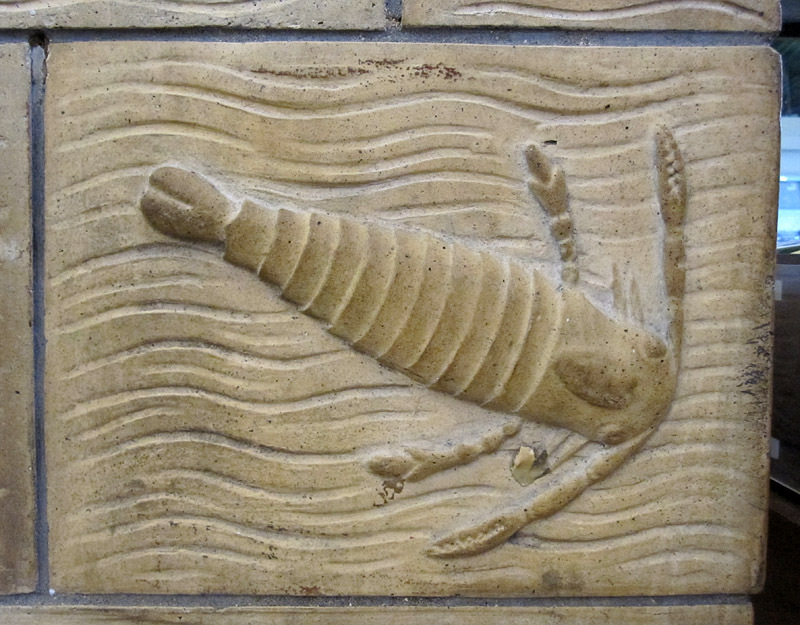 This eurypterid swims across a tile on an interior wall. It is truly touching to see the total enthusiasm that the stonemasons and carvers brought to their work in these 19th century buildings. Their creations were labours of love…. a contrast to the drier, strictly practical buildings that are constructed now. It is more than obvious by your knowledgeable comments Graham, that they also knew a great deal of paleontology! Thank you, Steve. 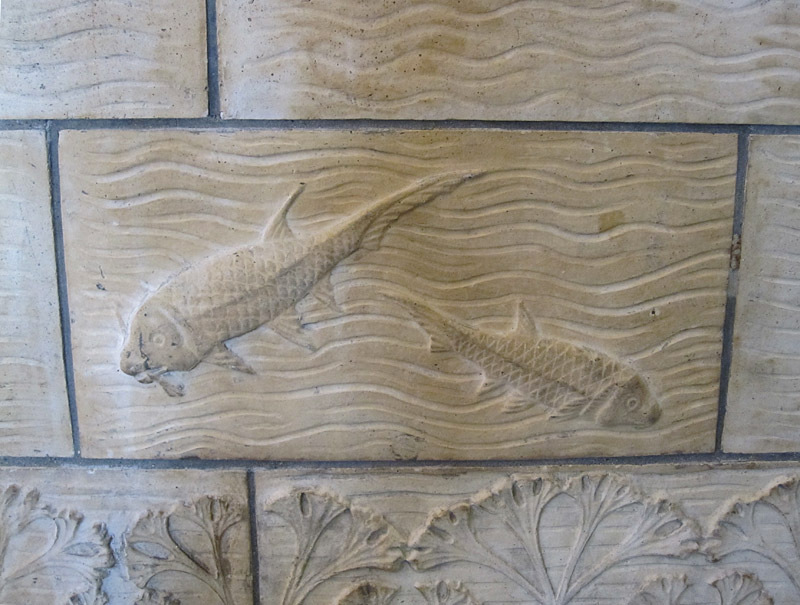 The sculptures at the NHM are actually cast terracotta rather than carved (I think this was a new technique at the time), but yes, they are truly marvellous and skilful decoration. 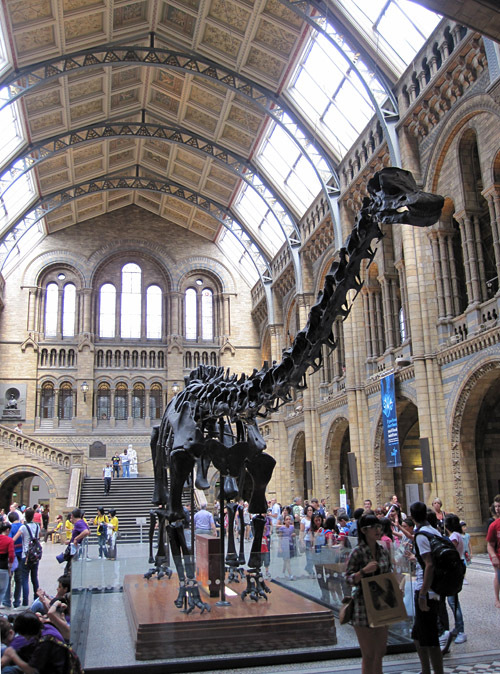 I visited the museum in 1997 and spent the entire day wandering around. It is just an amazing place, a national treasure for sure. 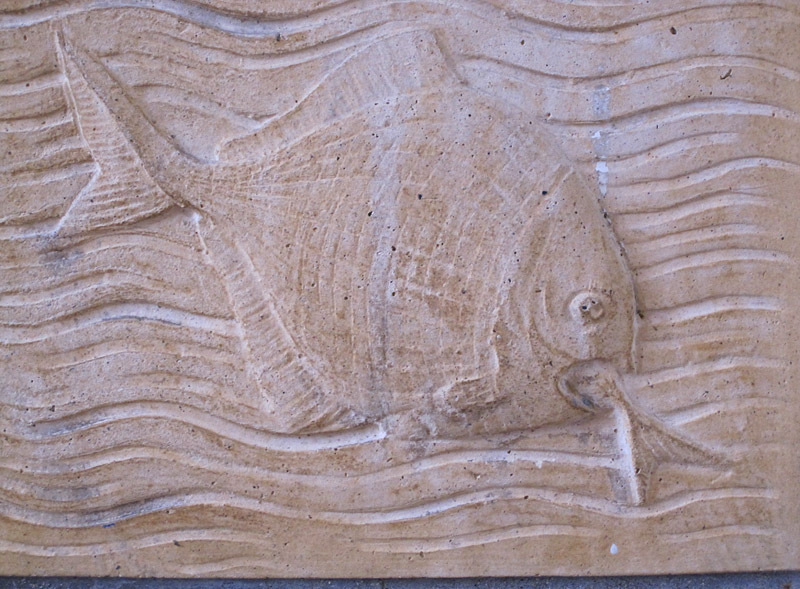 The attention to detail in the relief sculptures is inspiring. Thanks for your comments , Graham. Many thanks for your comment also! What a fantastic building! I wonder how many people have enjoyed it as much as you, and now us. Thank you! What a spectacular facade, inside and out! Thanks for sharing! Christine, many thanks for your visit.